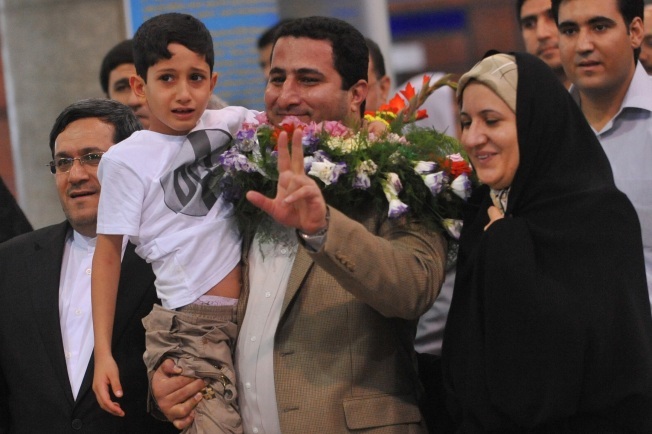 Shahram Amiri arrives at Imam Khomini Airport July 15, 2010 in Tehran, Iran. Iranian scientist, Shahram Amiri, has charged that he was abducted by the CIA in Saudi Arabia a year ago, harshly interrogated and taken to the U.S. The State Department denied that Amiri was kidnapped, saying he had been in the U.S. "of his own free will" and was free to go. Amiri denied involvement in Iran's secretive nuclear program. In addition to being a good yarn for news outlets this week, the unusually high-profile case of Shahram Amiri — an Iranian scientist reportedly given $5 million for information about Iran’s nuclear program — offered a rare opportunity to pull back the veil on how the CIA pays those willing to defect to the United States with valuable information. As news broke of Amiri’s appearance in Washington, D.C., and subsequent return to Tehran, a number of unidentified U.S. officials highlighted the fact that Amiri received $5 million from the United States and that this amount was indicative of the value of the information he gave intelligence officials. Others, however, said the figure was pretty normal, suggesting that hype around the $5 million exchange was overblown. “Five million dollars is really not that much when you consider it’s not a one-time payment, it’s building a new lifestyle for someone coming into the United States,” said Bruce Reidel, a former CIA officer who now works at the Brookings Institution. Earlier this week, Amiri traveled from Arizona to Washington, D.C., where he sought refuge in the Iranian interests section of the Pakistani Embassy and said, in a video, that he had fled U.S. authorities and now wanted to return to Iran. Reidel said U.S. authorities likely leaked that Amiri had received $5 million in order to rebut his claims he had been abducted and to counteract Iranian spin on the event. Every year, the CIA has access to millions of dollars, provided by taxpayers, to pay defectors like Amiri for important information that is given at personal risk, several U.S. officials and experts confirmed. The CIA has the authority to let a certain number of foreign citizens bypass the immigration and visa process to resettle as defectors in the United States for intelligence purposes, a U.S. official said. The process of resettlement is "by no means a common occurrence," the official added, and involves creating what he described as a "long-term benefits package" so the foreigners can be self-sufficient in the United States. Officials who spoke anonymously did so because they were not authorized to discuss the case. This process of resettling a defector, said former CIA agent Bob Baer, is an intense and often messy one. The CIA director gives the final OK for exactly how much money a specific defector should receive, Reidel said, with the Senate and House intelligence committees being informed of the background of some — though it seems not all — defectors. In this case, it is unclear how much the House and Senate intelligence committees knew about Amiri and what he was given by the CIA. Rep. Silvestre Reyes, D-Texas, current head of the House Intelligence Committee, did not respond to a request to comment. The money is often paid out over a long period time — upwards of 20 years — and is designed to create an incentive for defectors to leave their countries, and sometimes their families, to relocate in the United States. It provides a base for them as they buy a home and attempt to create a new livelihood, sources said. The CIA would not comment on the specifics of the financial terms of the reported deal with Amiri. When he returned to Tehran on Thursday morning, Amiri told local media he had been kidnapped and tortured by U.S. and Israeli authorities, and that the CIA had offered him $50 million to stay in the United States, which he said he turned down. Several U.S. officials told NBC News, however, that Amiri had been in contact with his family and that they may have felt threatened by the Iranian government, which knew of this contact. It is unclear whether Iranian officials now view him as a pro-Iranian propaganda tool or as someone they can use to send a message to other would-be defectors, Reidel said. "They'll try to get the maximum propaganda value out of him," a current U.S. official said. "And his safety depends on him sticking to that fairy tale about pressure and torture." Robert Windrem, NBC's national security producer, and Jim Miklaszewski, NBC's chief Pentagon correspondent, contributed to this report.